Did any of you watch the Diamond Jubilee festivities from the UK over the weekend? I watched a bit. It looked like typical British weather with torrential rain. But that certainly didn't make the Queen stay indoors. Last year I made my personal flag quilt and have been celebrating my 1/4 British heritage since then. I've been planning and working on my London 2012 quilt and I'm really having fun with it. 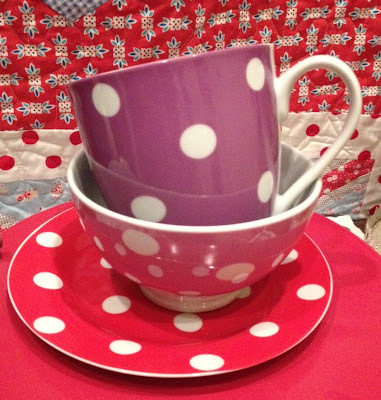 and a set of polka dot dishes with a teacup pretty enough for a queen. Loverly, all of them. 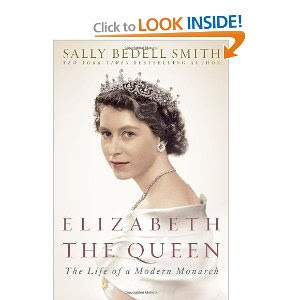 I'm just finishing this book about the life of the Queen. I have a new appreciation for Elizabeth II after reading this book. Some parts were a bit dry but I really like biographies and this story of the Queen's life was very enjoyable. 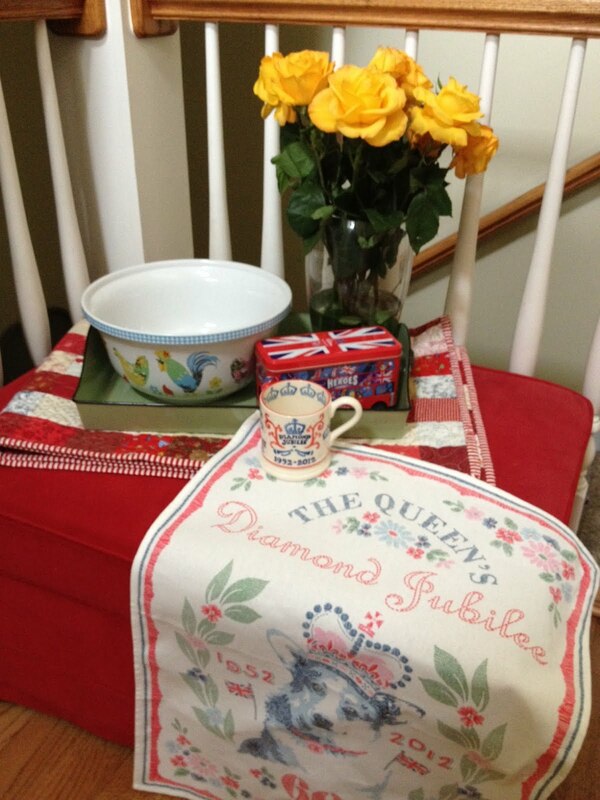 I read on one blog that British tea towels with queen icons are the hot items now. You are so on top of things! Such pretty blocks! I really love the teatowel. And yes we watched some of it. I even had company as my daughter wanted to catch a glimpse of Kate Middleton. Love your jubilee goodies, we have some tins from Marks and Spencers but now I just want more Jubilee stuff. Love your cool mug. I got the cheepie in case I broke it. 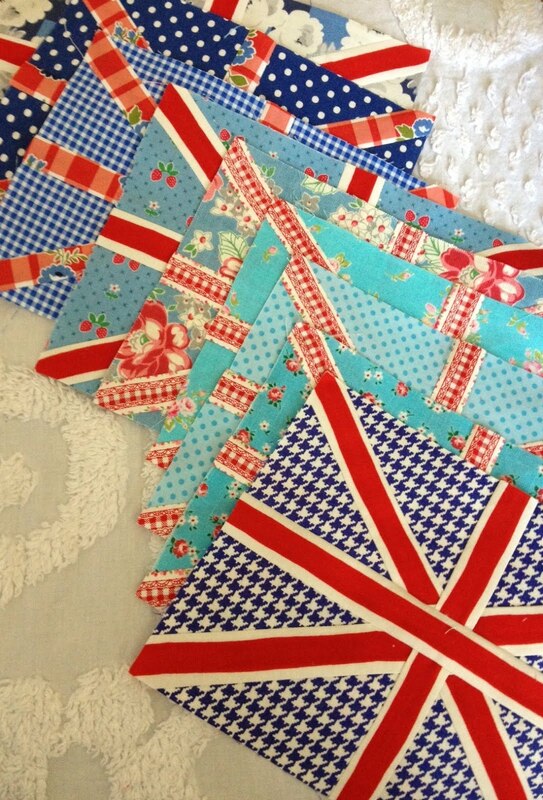 Love your Union Jack quilt blocks. Super cute! I love your tea towel. I listened to the book on tape it was wonderful to learn so much about her life. Such flags! Nobody does it like the British. They have it all, the costumes, the carriages, the abbeys, the palaces, and the Royals. Wonderful spectacle. Here in Canada, CBC had it commercial free for three hours! Thank you to them. Nothing could dampen the spirit and I had tea too! You lucky girl -- all your goodies look wonderful. 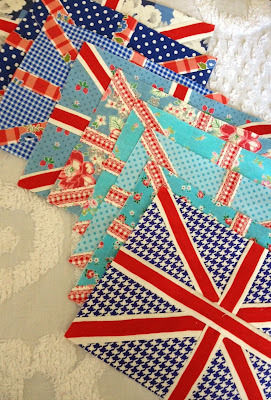 I LOVE those Union Jack blocks -- I REALLY want to make some!!!! Queen Elizabeth has always impressed me as what a monarch should be. I'll have to see if that book's available to listen to - I'm a lot more likely to get it read that way. EEK! I am 1/2 British, so I should be making me some of those blocks. And ... reading that biography, because I LOVE reading biographies. I have enjoyed the small part of the Jubilee I have watched. They really know how to throw a party, that's for sure. Fun to catch up with you! Great stuff as usual!! Everything is so fun to look at and enjoy. You always have such pretty displays. I love biographies and will have to look this one up. Thanks for the lead. I'm always looking for a good book. Love that tea towel! I read the biography too and also found it a bit dry. And I agree with the respect part. Lots of lovely things to see as always! Have just got back from the celebrations in London. We had a great time despite the weather. Met quite a few Americans who were over here in the UK just for the Jubilee - great stuff! Sigh. You must have so many lovely things in your home. I think I would pass out there! I've been debating whether to check that book out of the library ... even if it's a bit dry, I'm such a fan of the Queen! Have you any idea where the Corgi towel came from? We have a Corgi named Lucy and I would love to have one of those towels. I've just finished the bio "Elizabeth & Philip and am looking forward to the newer bio Elizabeth the Queen. Nanette, your London quilt is truly special combining your love for your heritage and all the fun things that remind us of London and the timing of this quilt couldn't be more perfect! It is lots of fun to see the souvenirs you collected on this occasion! They are all very cute! !